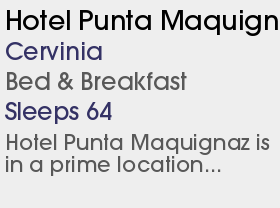 1 Chalet Hotel, 3 Half Board Hotels, 1 Club Med All Inclusive Resort and 1 Bed & Breakfast. WEsay A high altitide resort with great long runs and a good snow record. 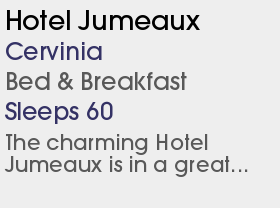 Linked to Zermatt in Switzerland this resort offers some good varied skiing. 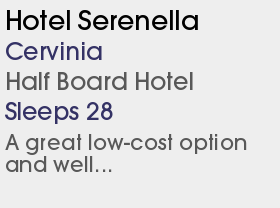 Cervinia ski holidays are enjoyed in one of the highest resorts in the Italian Alps. It is dominated by the mighty Matterhorn and surrounded by some of Europe's grandest peaks. From the Piccolo Cervino viewpoint there are fantastic views of the Gran Paradiso, Mont Blanc and the Monte Rosa. 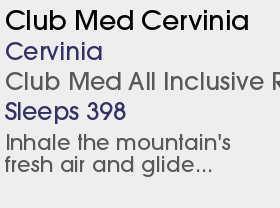 Cervinia's ever increasing popularity is due to its excellent snow conditions, long hours of sunshine, variety of runs for all abilities and a compact resort area offering plenty of après ski activity. 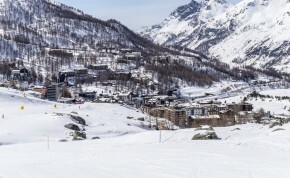 The centre of Cervinia is closed to coaches and access to central hotels on arrival/departure day is on foot. With an area pass the ski area opens up to include world famous Zermatt in Switzerland with some very challenging skiing. The main lifts rise out of the resort to some very high skiing indeed. Even the main mid-mountain hub sits among the clouds at 2,550m and the highest lift stops at the giddy height of 3480m. There's a wide range of skiing available as well as the chance to ski across the Swiss-Italian border. The Italian side also features one of the world's longest runs, which is 22km long with an impressive vertical of 2,350m. If you ever manage to tire of the skiing then there's all the usual off slope activies: kite-skiing, snowbiking, paragliding, iceskating, etc. 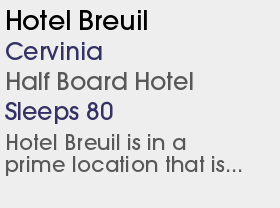 There's really no reason to be bored in Cervinia. The nightlife is somewhat tamer than neighbouring Zermatt, but as with all resorts there is a selection of bars, and even some very late night action.